A redesigned GMC Sierra is coming next year, so for 2013, the Sierra 1500 sees few changes. Heritage Blue and Sonoma Red are new colors, and the available 6-speed automatic transmission gets powertrain grade braking. The 2013 GMC Sierra 1500 is sold in regular-cab, extended-cab, and crew-cab styles with a choice between a short, standard, or long cargo bed. 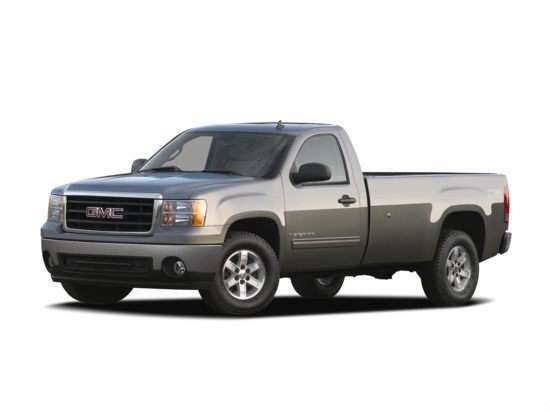 GMC offers the Sierra 1500 in Work Truck (WT), SL, SLE, SLT, XFE (Xtra Fuel Economy), and Denali trim levels. A Sierra Hybrid model is also available, and is discussed in a separate overview. The Sierra Regular Cab and Sierra Extended Cab have a standard 4.3-liter V-6 engine rated to make 195 horsepower at 4,600 rpm and 260 lb.-ft. of torque at 2,800 rpm. A 4-speed automatic transmission is standard, and GMC says the V-6 can tow as much as 5,400 pounds. For extra power, a 4.8-liter V-8 engine is standard for the Sierra Crew Cab and optional for regular-cab and extended-cab models, good for 302 horsepower at 5,600 rpm and 305 lb.-ft. of torque at 4,600 rpm. A 4-speed automatic is standard with this engine, which can tow up to 7,200 lbs. when properly equipped. Most 2013 Sierra 1500 models can be optioned with a 5.3-liter V-8. This engine generates 315 horsepower at 5,200 rpm and 335 lb.-ft. of torque at 4,000 rpm, and is equipped with Active Fuel Management cylinder deactivation technology to help improve gas mileage. This engine also upgrades the Sierra to a 6-speed automatic transmission with standard powertrain grade braking. The maximum tow rating is 10,000 lbs. A bigger V-8 engine is optional for Sierra Extended Cab and Sierra Crew Cab models, and is standard for the Sierra Denali. It’s a 6.2-liter V-8 engine producing 403 horsepower at 5,700 rpm and 417 lb.-ft. of torque at 4,300 rpm. This V-8 is paired with a 6-speed automatic transmission with powertrain grade braking, and is ready to tow a maximum of 10,700 lbs. The Denali model is also equipped with an exclusive all-wheel-drive system that is not shared with other Sierra models. Depending on the powertrain selection, and measured for combined driving, the 2013 Sierra returns between 14 mpg with the 6.2-liter V-8 engine and 18 mpg with the XFE version. In crash tests, the 2013 Sierra 1500 receives an overall rating of 4 stars from the National Highway Traffic Safety Administration (NHTSA). The Insurance Institute for Highway Safety (IIHS) gives the truck a “Good” rating for frontal-impact protection, an “Acceptable” rating for side-impact and rear-impact protection, and a “Marginal” rating for roof crush strength. Among the technologies offered for the 2013 Sierra, GMC provides access to a touchscreen navigation system, a premium surround-sound audio system, a rear-seat entertainment system, a heated steering wheel, and heated and ventilated front seats. Rear parking sensors, a reversing camera, and an integrated trailer brake controller are also available.